: Florence-born-and-raised chef Fabio Viviani, “Top Chef Season 5 Fan Favorite,” started spending time in the kitchen at the age of five, peeled vegetables in a restaurant at twelve, and started cooking at fourteen. After improving his skills at a local culinary school, he had four restaurants in his native city by the age of 26. Along the way, he met Jacopo Falleni, his partner, and the duo have worked together in the US for many years. 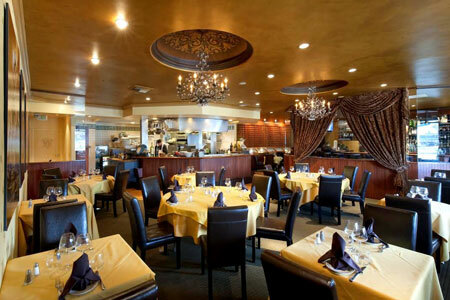 Firenze Osteria is a joint venture between them and restaurateur Lisa Long. Do like the numerous executives of the nearby studios: come for simple, home-style Italian dishes cooked with passion and no sign of pretention. Start with prosciutto di Parma with melon and buffalo mozzarella or pancetta-wrapped shrimp stuffed with Gorgonzola and served over Parmesan polenta. Pasta dishes include lobster ravioli and seafood linguini heaped with shrimp, calamari, clams and mussels in a tomato and white wine sauce. Whole oven-roasted branzino arrives at the table cooked as it should and flavored with slices of lemon, olive oil and thyme. Chocoholics must try the flourless chocolate cake; go for the panna cotta if you’re in the mood for something lighter. Since Falleni is a mixologist, there is a long list of signature cocktails. They also offer reasonably priced wines from Italy, France and California. The nightly happy hour (in the bar from 5 p.m.-7 p.m.) features discounts on glasses of wine, plus $2 mini martinis.